Next to 'chocoholic' in the dictionary you will find a picture of me, fact. Well possibly not, however my love of chocolate runs deep and since I made a concerted effort to dramatically reduce the amount of sugar I was consuming on a daily basis, I have been on a near constant look-out for healthier alternatives to the milky, sugary chocolate I do love so very much. I first discovered The Raw Chocolate Company when I was visiting Leeds and decided to pop into Out Of This World, a rather lovely health food shop. They had these big bags reduced to around £4 (RRP £5.99)which is admittedly a smidge pricey, but I was really intrigued. I had heard about mulberries from reading various healthy food blogs and was keen to give them a try. 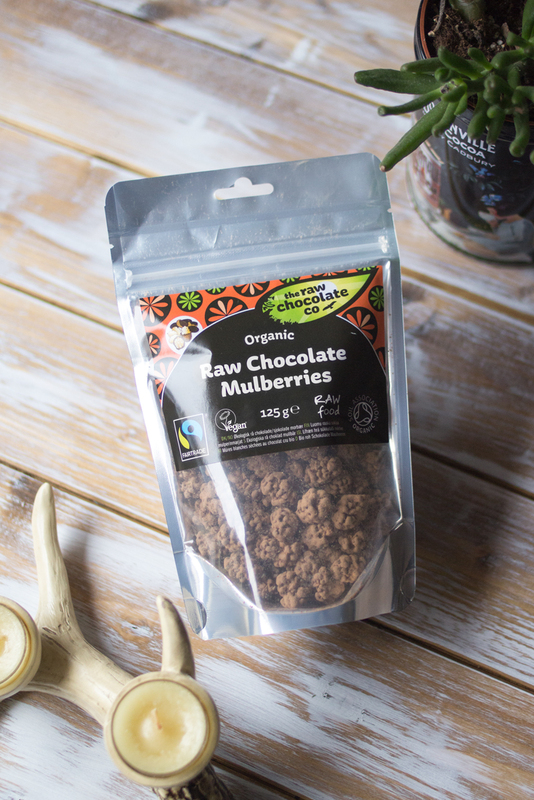 Since purchasing the larger 125g bag, Holland and Barrett have started stocking the 28g snack packs (RRP £1.49) of the raw chocolate mulberries, as well as raisins and goji berries, so it only felt right to compare all three! 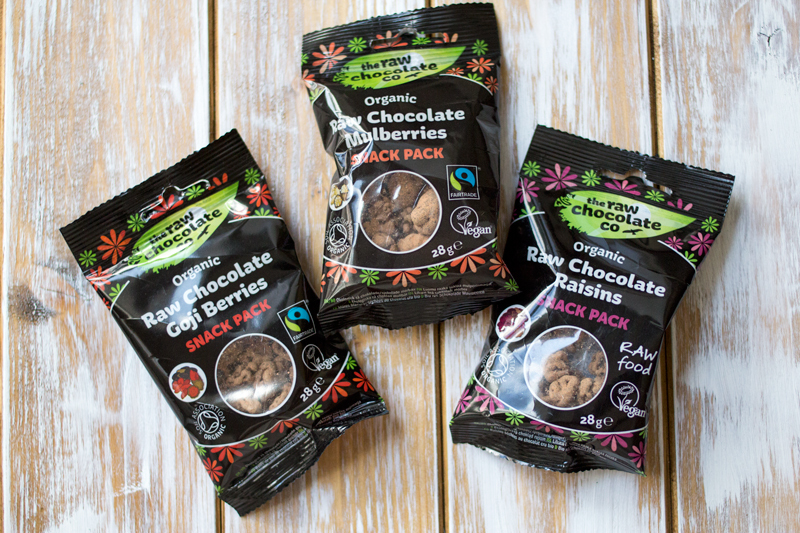 The snacks are all organic, Fairtrade, vegan, soy-free and gluten-free. The ingredients are raw cacao mass, coconut palm sugar, virgin cacao butter, cacao powder and then either raw mulberries, raw goji berries or raw raisins (which include sunflower oil). These little chocolatey bites are rather odd to look at, all lumpy, bumpy and powdery. 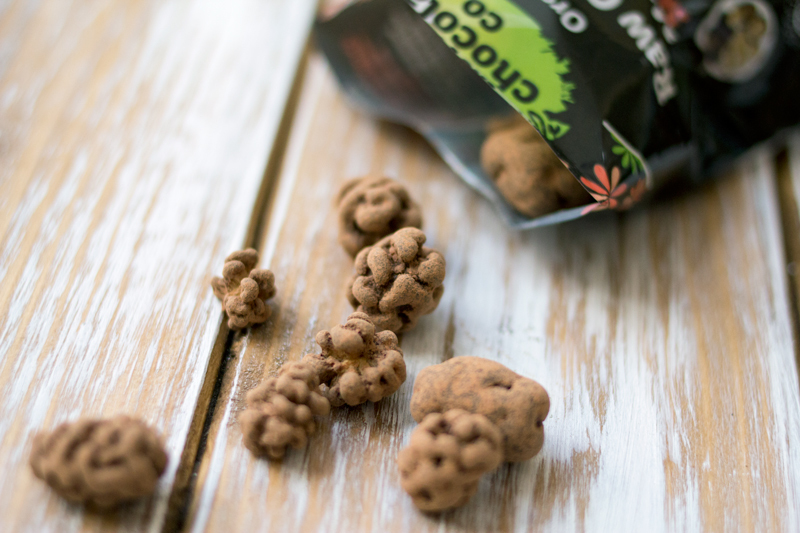 Don't let their appearance be deceiving however, as they are deliciously chocolatey, with a hint of a caramel flavour from the dried mulberries and a satisfying chewy texture, with a slight crunch too. Out of the three they have the lowest overall sugar content, which is primarily what I'm concerned with, although all three do have quite a bit of fat, albeit natural. The raisins taste like the healthier version of their classic chocolate-covered counterpart and are considerably softer than the mulberries. They're not obviously raisins from their appearance, but do have that distinctive taste (if raisins aren't your thing). These come in the highest out of the three for sugar, which isn't surprising because after eating raisins, my teeth always ache. 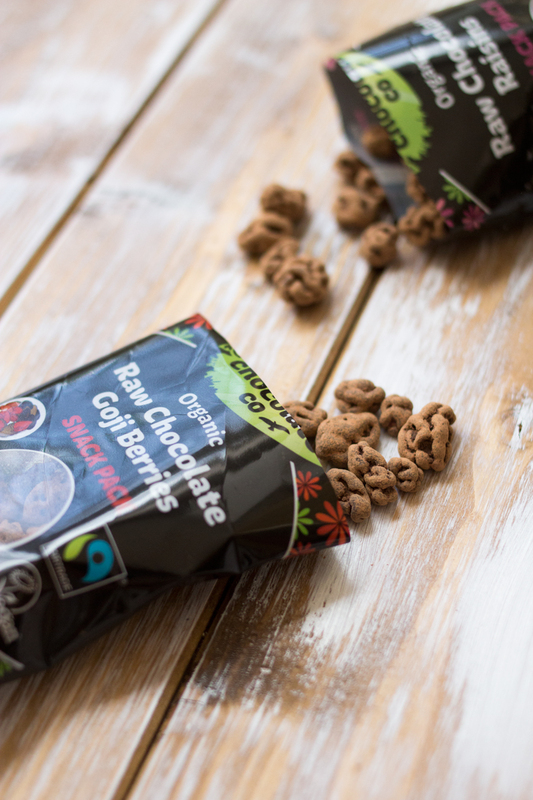 The goji berries are much stronger in flavour than the other two, which in a way almost makes them taste less sweet, despite them falling in second in relation to sugar content. They are tasty, but in my opinion, not quite as nice as the other two. They do however have the most protein, which could make them better as a post-workout snack, although the protein isn't nearly as high as snacks specifically designed for this. If you're after something that mainly tastes like chocolate then I would choose the mulberries as their flavour is much milder. Also in regards to the raw chocolate, whilst it doesn't taste particularly bitter like traditional dark chocolate, it is not milky tasting and is definitely more intensely flavoured due to the raw cacao. I personally think the chocolate is absolutely delicious, although I am glad they come in smaller snack packs to stop myself from eating the whole lot of a 125g bag! The mulberries are definitely my favourite out of the three, then the raisins and lastly the goji berries. I'd highly recommend giving these a try, although definitely start with a smaller snack pack as opposed to sinking over a fiver on something you may not like. I'm definitely keen on trying out more products from The Raw Chocolate Company in the future! This post is not sponsored, all opinions are my own. I'd eat any choc. covered berry nut, fruit, biscuit anything. Definitely up for these vegan ones! thanks for sharing - they look really tasty. however i might have to give the goji berries a miss, probably a bit too much of an acquired taste for me! Wow these look so good my mouth is watering! This look delish! I've never had goji berries but have always wondered what they tasted like! :) Great post! These look so good! I've had mulberries a couple of times and really enjoyed them. And raw chocolate is so delicious. Will have to keep an eye out for these!